Experience a Texas Hill Country spring at Wildseed Farms, while sampling the most delicious Wine and Food from the HEART of Texas Wine Country! We’re bringing together libations, vibrations, and great Texas food in a celebration of Texas Wine and Texas Culinary Traditions. 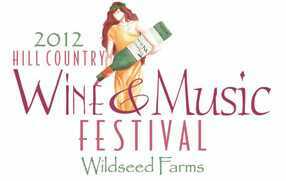 The Festival will be held at Wildseed Farms, just east of Fredericksburg, Texas. Come join us for a Wine and Food EXPERIENCE TEXAS-style. Sample Texas Wine and Hill Country cuisine from participating restaurants and specialty food purveyors. The 2012 Festival Music line-up includes Texas Hill Country Favorites: Trevor La Bonte Jazz, John Arthur Martinez and Joel Guzman, the Almost Patsy Cline Band, and Thomas Michael Riley! Come on out for THE WINE & MUSIC LOVERS FESTIVAL, and support the Texas Center for Wine and Culinary Arts!